Wait, Crabs Can Climb Trees?! Filed to: got crabs?Filed to: got crabs? 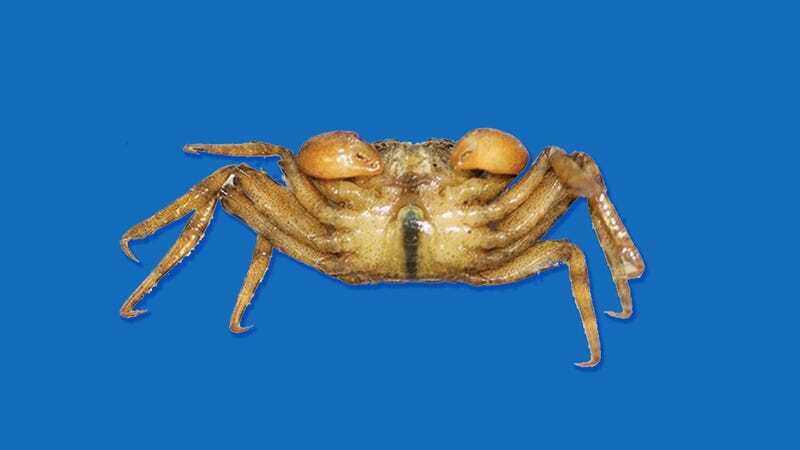 Scientists recently discovered a new species of crab in Hong Kong. It’s very tiny, less than a centimeter long. It also climbs trees, which is terrifying. You probably didn’t know that crabs could climb trees, but they can. This new species scales tree bark as high as six feet in the air and loves to chill in mangroves, according to a field survey published today in the journal ZooKeys. Dubbed the Haberma tingkok, the species is part of genus that was discovered only 15 years ago, by Peter Ng from the National University of Singapore and his team. Dr. Ng also helped discover this tiny new tree-climbing crab, a species whose days might be numbered due to pollution and land reclamation. Also, it kind of looks like a mutant frog. But back to the tree-climbing detail. Crabs climb tress! Here’s a video of the coconut crab, the largest terrestrial arthropod in the world. They like to climb trees, and—you guessed it—eat coconuts. Look at it! Nature is a wonderful, boundless thing, and the animal kingdom alone continues to be full of surprises. If you want to learn more about the tiny new tree-climbing crab species, you can read the open access research paper. If you want to see another utterly jaw-dropping coconut crab video, just click below.